Exercise and myself have a decidedly frosty relationship. I'm far too lazy for all the running, cycling and lifting of heavy things, a necessity to be healthy in this modern age. Frankly, it all rather looks like too much work, if you ask me. Plus the smooth sounds of James Taylor on my generic MP3 player is more likely to put me to snoozing, as opposed to running five miles. I have however taken a different tactic, I try to eat as healthy as possible. Salads, fruit and lots of rice dishes. But what I have never been able to get on with is the little pots of yogurt that you're meant to drink everyday. They just taste horrible to my taste buds. It has led me to wondering though, what is the difference between a prebiotic and probiotic? The world of chicken keeping isn't that different either. There are several poultry tonics advertising themselves as being Prebiotic or Probiotic aids for your flock. But what is the difference? After a little investigating the difference is actually fairly simple. A Prebiotic is a general term that applies to things which promote and induce the growth of beneficial micro-organisms that help the well-being of the host. A Probiotic is a term that covers things that actually contain the beneficial microorganisms already. So, if its a Prebiotic you're helping them grow, if its a Probiotic you're hens are just drinking or eating them directly. 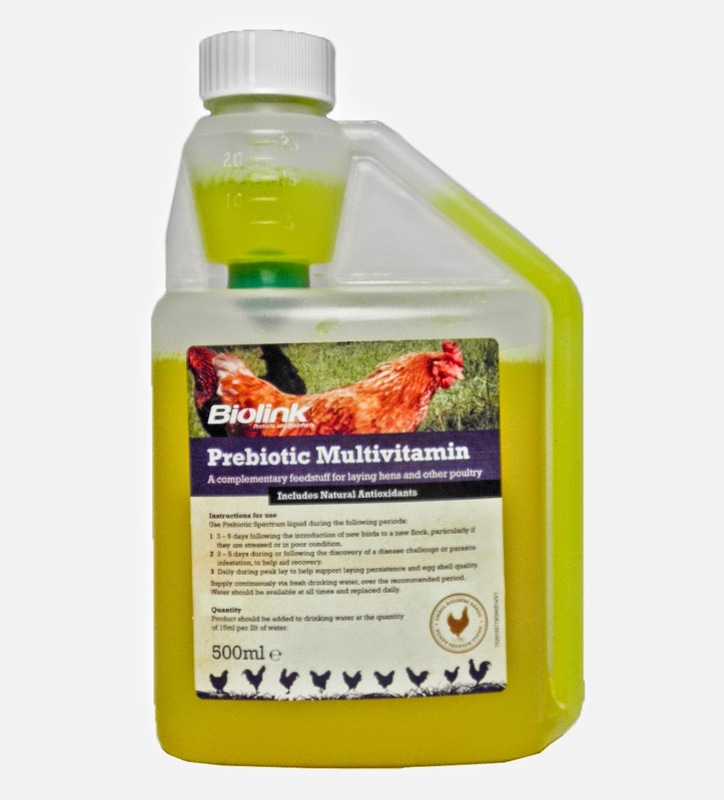 The Biolink Prebiotic Multivitamin Poultry Tonic 500ml is a liquid complement for laying chickens. 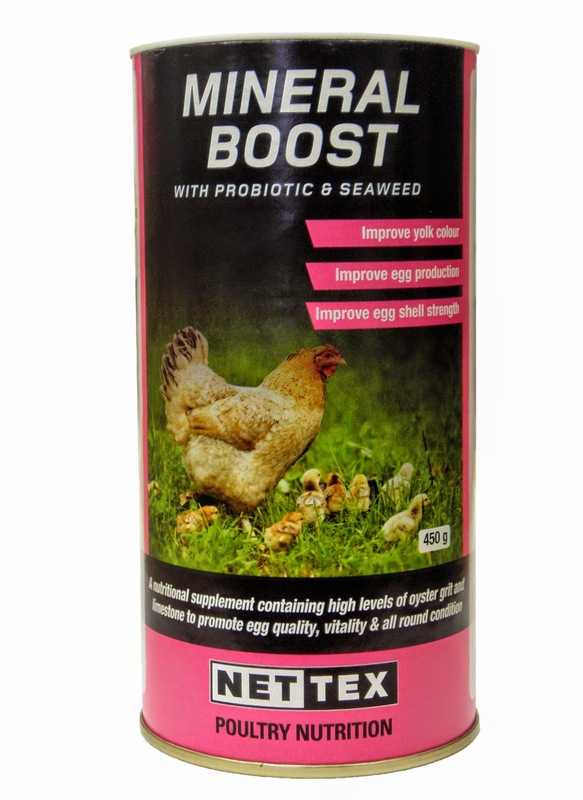 The Prebiotic is introduced into the intestine ensuring a suitable environment so the beneficial bacteria can take up residence, giving your hens a much needed boost. It also contains antioxidants to aid in strengthening the immune system and and multivitamins for the general well-being of your bird. At a dosage of 15ml per 2 litres of drinking water it goes a long way when feeding to a bird for a period of 3 - 5 days. At the other end of the scale is the Net-Tex Mineral Powder 450g, with probiotics and seaweed, for a complete nutritional diet. Containing Probiotic Saccaromyces Cerevisiae, high in protein, amino acids and B vitamins, the Probiotics stimulate extra immune protection for your girls. The added seaweed aids in eggshell quality, while the limestone and grit help the chickens all round natural condition. A rounded teaspoon added into the feed will aid around 15 birds a day, while you should add the Net-Tex Mineral Powder 450g to feed roughly twice a week for maximum benefits. The difference in the end between Prebiotics and Probiotics is fairly simple, and both will aid your hens in being healthy. If you have any questions about supplements to give your hens why not leave a comment below or call us at Flyte so Fancy on 01300 345229. The 19th of June 2013. 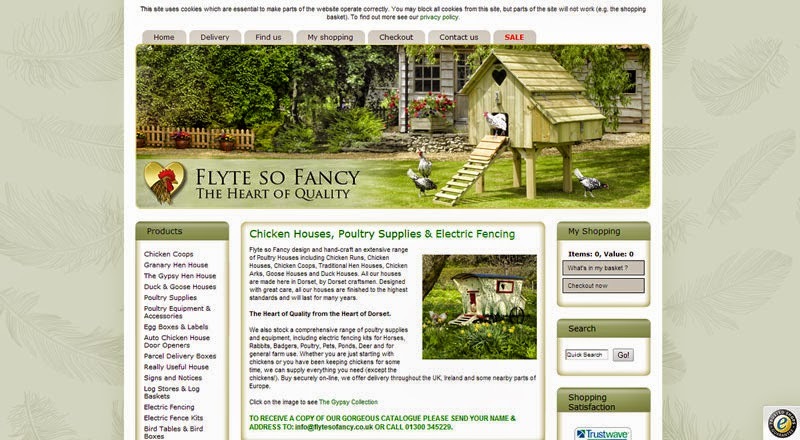 Two brave Flyte so Fancy workers set out into the summer heat to build a Flyte so Fancy Poultry Protection Pen. ...OK, if I'm being honest, the Ops Manager Richard and myself have built thousands of these Poultry Protection Pens, and it wasn't quite as dramatic as the opening might suggest. I do however remember it being very hot. The difference this time is that we set up the Flyte so Fancy camcorder to show the process of building one of our walk in pens, just how easy to assemble they really are. With an cordless screwdriver, an assistant and a cup of tea, you can have the 9 x 9 protection pen together in an hour. The protection pen is a light-weight walk in chicken run, to keep your hens safe from predators, other wild birds and contaminants. Made from panels, that simply screw together the Protection Pen is completely wired in inch by half inch weldmesh, which is incredibly durable, will stop foxes from breaking in and is plastic coated to keep it looking smart. 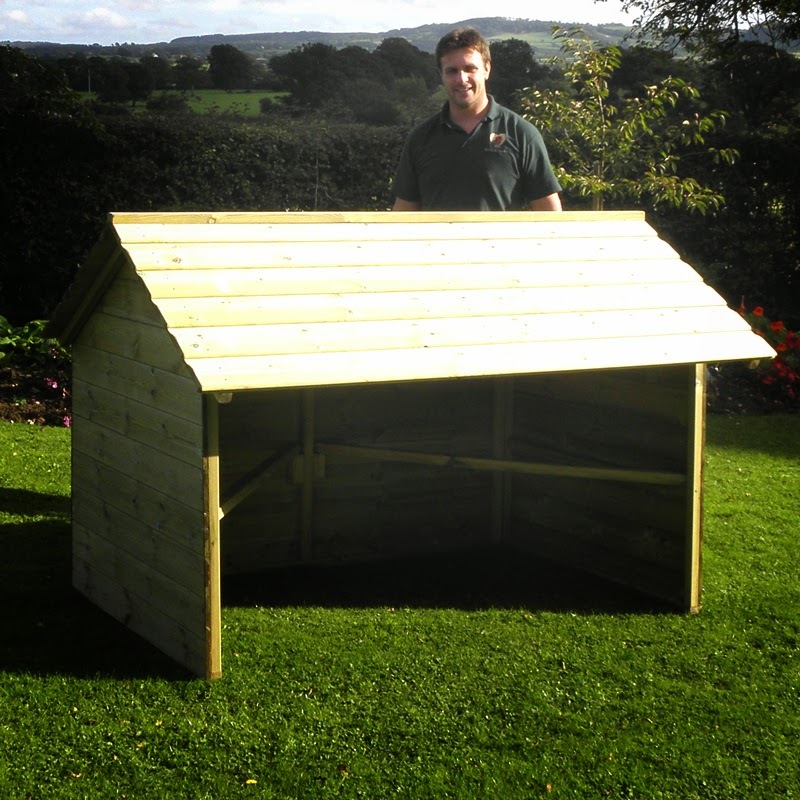 A strong stable unit once fully assembled, the Protection Pen is an ideal secure run for your chickens. Coming in a range of sizes from 9ft long up to 24ft long, the chicken pens can also come in variances of width, 6ft or 9ft, the smaller 6ft wide Junior Protection Pen being ideal for smaller gardens. There are also numerous extras for the Protection Pens, handles for smaller sizes for easy moving, mating panels for hen houses, no dig skirts to prevent predators burrowing in and the addition of a polycarbonate roofing to help protect your birds from the rain. In our video Rich and myself are constructing a 9ft x 9ft Protection Pen (myself playing the role of the gangly Igor). The video has been sped up, however we had the pen built within half an hour. The addition of the handles is but a minutes work, and with the help of Mark and Toby from the workshop, it really demonstrates both how strong these chicken runs are once finished and how easy they are to move. If you would like to know more about our Protection Pens, or would like to know which chicken run might be best for your and your hens, why not leave a comment below or call us on 01300 345229. After last weeks blog about the best selling poultry drinkers here at Flyte so Fancy, we thought we'd follow it up with the other necessary for chicken keeping and have a look at the best selling poultry feeders. If there is one thing that chickens like doing it is stuffing their beaks (well the Flyte so Fancy flock do at least) so making sure that you; have a hard wearing, durable feeder that isn't going to get knocked over, filled with rubbish or let them throw food everywhere, is important. FSF HQ has stocked the Wise Feeder for a couple of years now and are still impressed by its really clever and well thoughtout design. With a rain shield to protect the feed, a large lip on the front to keep the feed in, dividers to stop hens throwing the food out and a changeable feed flow control plate; everything about this feeder has been designed to avoid waste and prevent vermin accessing your feed. Available in either a 5kg cage mounted option or as a 10kg bracket mounted feeder, these really are popular with both back garden chicken keepers and larger flocks too. The ability to add extension cartridges means you can increase the feeders capacity by increments of 5kg, to hold more feed. The dimensions of the wise feeder are 12 inches by 5.5 inches by 7 inches. The Blenheim Feeder is a brilliant heavy duty plastic feeder made in the UK, designed to hold 6kg of layers pellets. 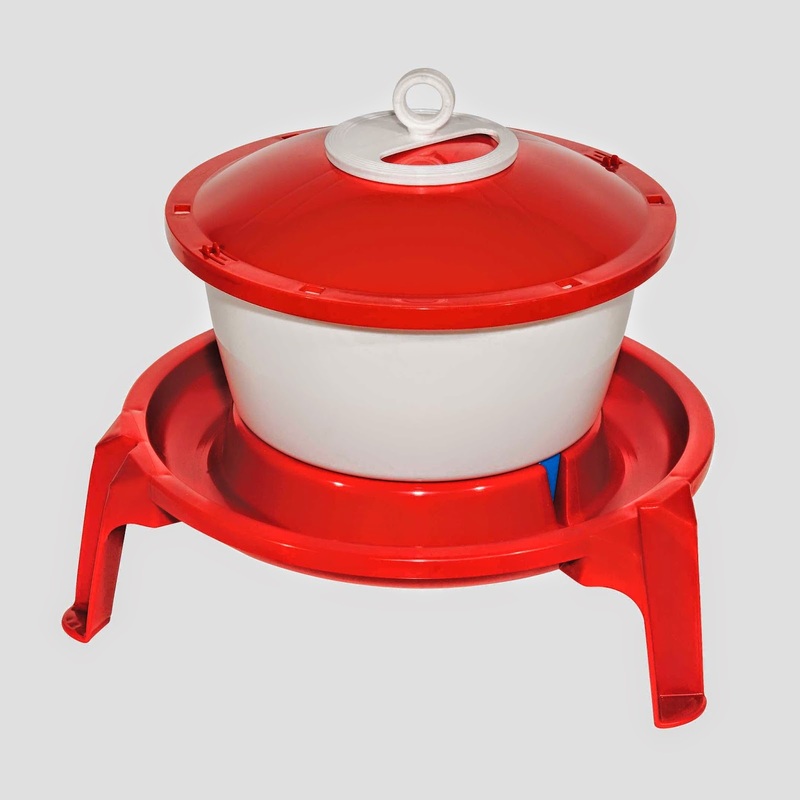 With its set of stable legs to lift it up off the ground, to avoid feed contamination, it also comes with an anti-flick ring to avoid food wastage and an anti-perch lid to stop hens sitting on top and ruining the feed. This brilliant feeder also comes as an outdoor option, with a large lift off rain hat that sits nicely over the feeder to keep your feed out of the weather. These feeders are great for the smaller flock owner of 12 chickens and provide a real high quality sturdy feeder for your chickens. Standing at 15 inches high and 14.5 inches in diatmetre this is a sensible sized feeder for chicken runs. We often use these for the hens that live in the houses of the Flyte so Fancy shop display area and find them absolutely ideal. An improved new design in the last few months has seen these already spectacular and very popular treadle feeders get even better. Suitable for chickens, ducks and turkeys, the treadle feeder is a great all weather outside feeder, which prevents both vermin and wild birds getting at your feed as they are not heavy enough to trigger the treadle mechanism. The new design features tough plastic components for the treadle, the hinged hopper lid and the feed trough. Much quieter in operation, you can also alter the weight at which the treadle activates. The trough also has an anti-flick grid to prevent wastage. The treadle feeder stands at 22 inches high by 14 inches wide and 20 inches deep. This is a large feeder. 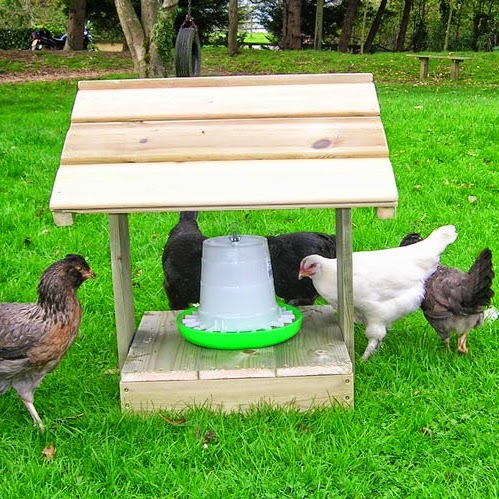 A large feeder, it is ideal for the owner of a small flock of chickens for putting their feed in and not having to worry about topping it up every other day, just as it is perfect for those with a large flock of birds in a wide paddock. You should allow around 200g of pellets per bird per day and so these feeders are ideal for keeping your feed secure and dry. The trough measures in at 14 inches wide and so allows several hens to feed at once. We have several of these feeders set up here in the FSF poultry paddock. Galvanised chicken feeders are continually popular with people looking for a heavy duty sturdy feeder that is going to last them years and years. With an adjustable height tube for changing how quickly the feed is dispensed and a large locking raincover lid that also has a handle. The 2.5kg feeder is incredibly popular and very well suited for small flocks of up to 10 birds, whilst the larger 7kg feeder offers a larger option for more birds. The 2.5kg Galvanised feeder is a very popular feeder, measuring ten and half inches high with a feed pan diametre of ten and a quatre inches providing plenty of room for multiple birds, which despite the initial cost will last for many many years. 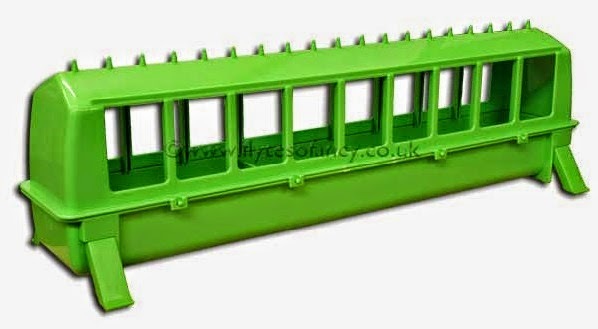 The green plastic feed trough is a strong plastic trough, with a really well thought out and clever design. It is suitable for all kinds of poultry and is especially good for ducks as it prevents their feed being spoiled by rain. 24 inches long and standing 6 inches high, the clip on lid prevents birds perching on top of your feed trough, while the large feed access holes on the side make feeding easy. Internally the trough is split in two, so you can fill one side with grit or water and the other with feed. The anti-perch feed trough is perfect for hens that still prefer mash as opposed to pellets, great for feeding younger birds crumb or growers pellets or with ex-bat hens with smallholder layers crumble and proves a popular feeder among keepers of both chickens and ducks. Again this is merely a small selection of the many feeders that we stock here at FSF HQ, from trough to hanging feeder or galvanised to plastic. If you have a question about one of these feeders or would like to know which might be best for your flock and garden, why not leave a comment or give us a call on 01300 345229. Equally watch Boss Phill talking through the various feeders available in our guide to poultry feeders here on our Youtube channel. A recent organised weekend walk on the last vestiges of a summery Sunday, found me trekking over the beautiful hills of Dorset, with the maximum amount of grumbling I could muster. Gates, styles, streams and the slightest change in incline where all met with the same verbose grumbling. However when I was informed that the terminus of our walk was a pub, my spirits soon lifted. Good job too, as by the time we arrived at the Rose and Crown I was well beyond merely parched and I availed myself of the local tipple with alacrity. There is nothing to beat a nice cool drink when your thirsty and our hens, ducks and geese here at FSF HQ are no different. We have numerous drinkers set up in our poultry paddock and chicken pens, but this week the FSF Blog is taking a different tack and looking at the Best Selling Poultry Drinkers that you, our customers, buy. A heavy duty, robust, British made plastic drinker, the 6 litre Combo drinker proves popular with people with only a few hens, or those who do not want to take up much room in their chicken pen with a great big drinker. 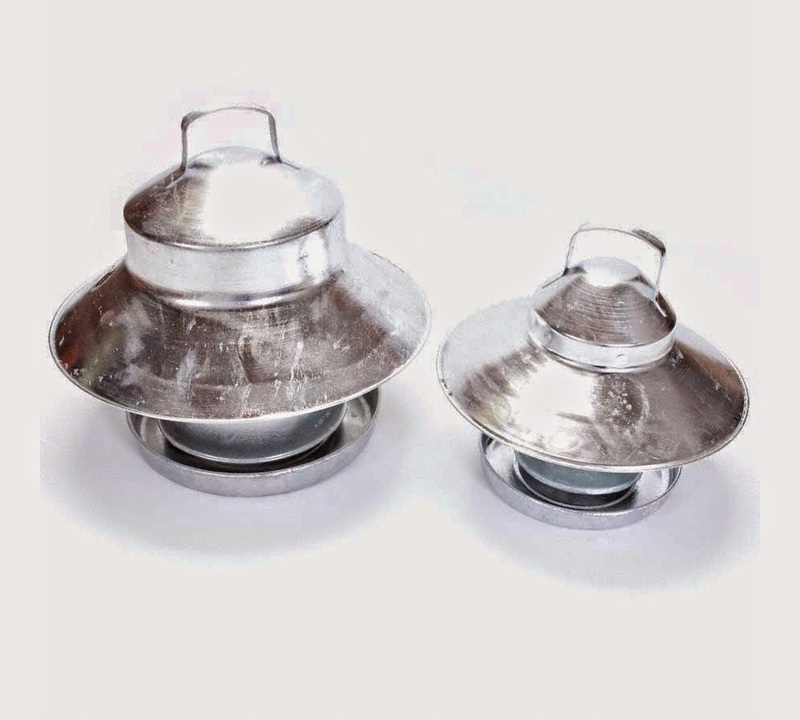 Coming with 3" legs to help pick the drinker up off the floor and with its wide deep saucer, to stop the water being fouled, the drinker is suitable for chickens, ducks and geese. 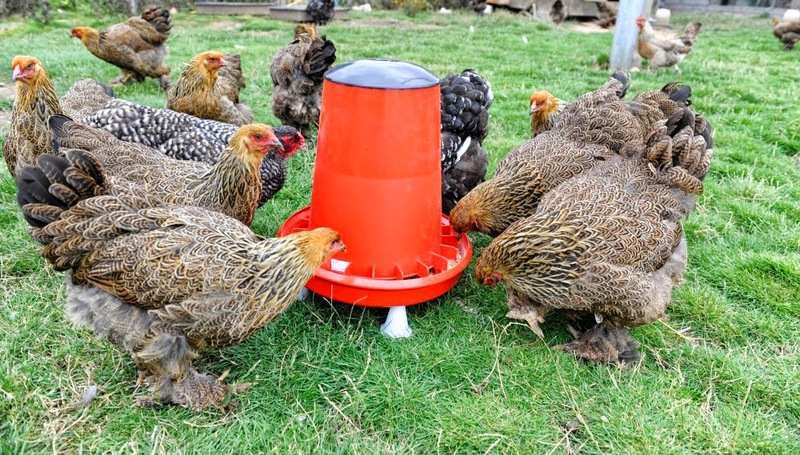 Consistently popular with customers, this British made Honeypot drinker is a great self contained poultry drinker for feeding your flock fresh water. Coming in a 10 litre, 20 litre or 30 litre option, these drinkers are easy fill through the top handle/cap. With the drinking saucer raised up off the ground, they always provide fresh water through a vacuum system and is ideal for larger poultry pens and paddocks to save you having to re-fill your drinker every day. Shaped like a bucket and lain upon its side, the Galvanised Metal Bucket Drinker, that holds around 13 litres, is perfect for chickens, but they are especially useful as duck and geese drinkers. The advantage with this design of drinker is that little sunlight can reach the water, which prevents green algae build up and due to it being raised up your hens cannot kick dirt into it. 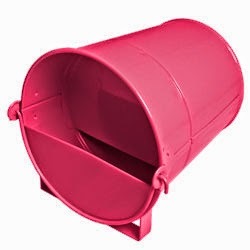 The drinker also comes in a colourful 4 litre painted size, in either pink or green to add a splash of colour to your chicken run. 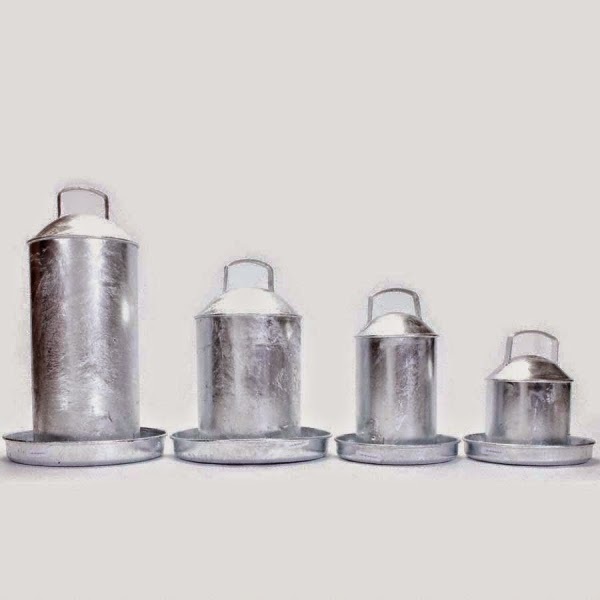 Metal, heavy duty fountain drinkers, made from sheet steel and then galvanised after manufacture, these are robust and sturdy poultry drinkers that will last a lifetime. 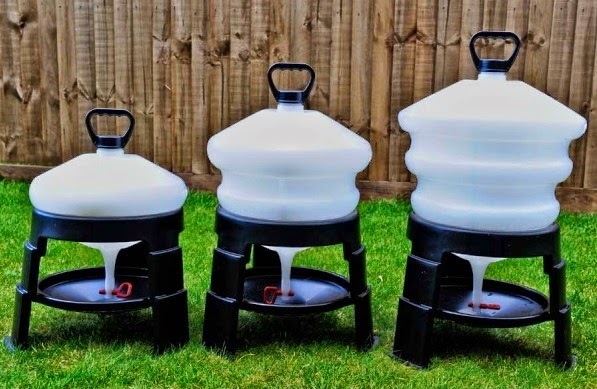 Suitable for chickens, ducks, geese and turkeys, they come in a range of sizes from 2.25 litres up to 13.5 litres, meaning there is a drinker to suit your number of hens. 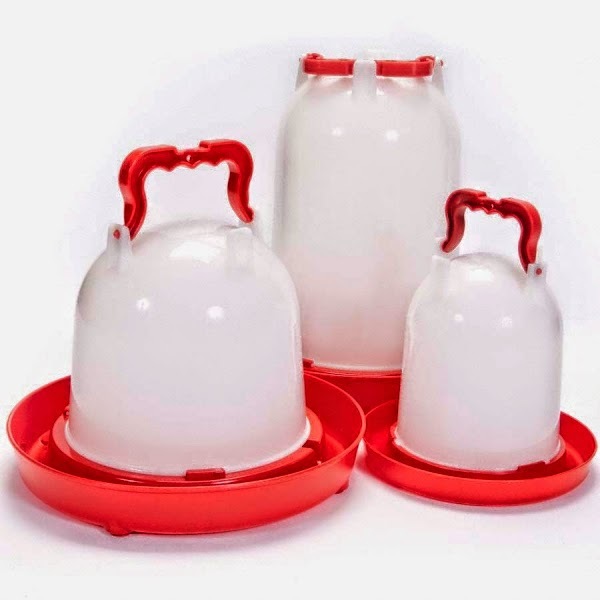 New in to Flyte so Fancy The Rapid Clean Tripod Poultry Drinker is an easy clean. easy to fill, with a strong plastic tripod stand that lifts the water pan up off the ground, keeping it clean and free of contamination. Available in either a 6 litre or 9 litre option, the high grade plastic used helps to slow the growth of algae within. The drinker is filled from the top, reducing any chances of soaking yourself at the tap and since arriving at Flyte so Fancy these drinkers have been flying off the shelves. This is merely a small selection of the numerous drinkers that Flyte so Fancy sell for every occasion and situation that a poultry keeper might have or need. If you have a question about one of these drinker or want to talk about what might be best suited for you and your girls, why not leave a comment, give us a call on 01300 345229 or watch our useful youtube video on our range of water drinkers. Just yesterday the Flyte so Fancy Team was sitting in the sun enjoying an ice lolly and remarking what "an incredibly warm afternoon it was" and throwing around phrases like "unseasonably hot" and "Indian Summer". It's a rough old life. We have somewhat been brought back to earth with a bump this morning as it is cold, grey and raining. So, much for "Indian Summer". The Flyte so Fancy Team aren't the only ones scrambling for a dry corner to work in. The residents of the FSF Poultry Paddock looking indignant have all shuffled under the available the shelters to keep their feathers dry. Suffice to say, the ducks couldn't care less. We have various shelters in our chicken field for our flock to stay dry under, from the very small to fit the smallest of gardens, to field shelters big enough to house two large pigs. A very small and versatile little shelter, this is designed to be used as a dustbath to save your flowerbeds, or if you turn the base upside down as a raised platform shelter for a feeder. While it might look small this is no lightweight box that will blow away and is a perfect little stay-dry spot for your hens. Worried that your girls need a little entertainment? Are they beginning to look a little flabby in the feathers? Well, the Chicken Jungle Gym is a one stop adventure playground for your hens. With multiple perches, different levels and hanging points for treats, it also has a roof for protection from the both rain and sun. We have one persistent hen who insists on perching under the roof in even the most torrential of rainstorms. The Chicken Dust n' Perchery is a large shelter with a rack of seven perches for your girls as well as some more inside for staying out of the rain, it has a substantial roofed area for the large dustbath, sheltering from the elements or for putting feeders and drinkers. Solidly built to be used by all breeds of birds, the Dust n' Perchery will withstand life in the outdoors with ease. The Chicken Shelter is a simple weather shelter, to give your girls somewhere to go to stay out of the rain during a downpour. They are also an ideal place to put feeders and drinker to keep them out of the elements. Coming in two sizes, the Small and the Large, the overhanging roof on the open front provides maximum protection for within the shelter. The small shelter comes with a single central perch for your birds, while the larger option has two internal perches, it has plenty of room for all. Both units are sturdily built, with a ventilation gap along the back panel to prevent the shelter blowing over in high winds. Both shelters come with stainless steel hooks for the hanging of treats or even feeders and drinkers. So snug do the FSF flock find these shelters, that we currently have a broody hen laying on a clutch of eggs within one at the moment. Of the same design as the Chicken Shelter, the Jumbo Shelter has it's own category for one reason, it is huge. Roughly 6ft by 4ft by 4ft, the Jumbo Shelter will hold around 15 birds, it was originally designed for a customer who kept pigs. With two internal perches for your birds, the Jumbo Chicken Shelter is a very large unit, for those whose flock has grown and grown. As I sit here tapping away at my keyboard the rain has actually stopped, the Despatch Team have tentatively poked their heads from out of the shop, while the chickens are slowly lifting their skirts out of the wet grass and heading out into the paddock. 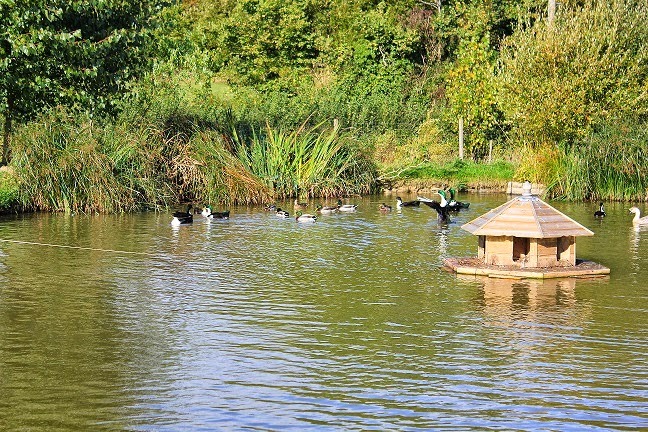 Regardless of the weather the ducks are continuing to cannonball off the floating duck lodge into the pond. This has just been a very quick guide to our different chicken shelters, if you have any more questions or queries, why not leave us a comment or give us a ring on 01300 345229. Driving home on Tuesday 16th listening, with the wireless dial firmly on Radio4's PM show, amid all the news and objectivity, there was an interesting little segment all about keeping cats inside or in an enclosed run, to help reduce their stress levels. The research was done by Dr John Bradshaw of Bristol University, who has discovered that stressed cats, which can lead to both mental and physical health issues for your moggy, when confined can be significantly happier. Doctor Bradshaw's findings highlighted three areas where keeping a cat contained had advantages. When all cats roam free, there is bullying and fighting over territory. Often leading the loser being to scared to go out. Busy roads are the main killer of young cats. Keeping a cat inside or an in a run helps encourage wildlife into your garden. During the interview Dr Bradshaw pointed to the example of Europe, with many people living in apartments, cats are kept inside with little detrimental effects to their health. While we are not arguing with his findings, Flyte so Fancy have a slightly different approach, with our outdoor cat houses and runs. The Cottage Outdoor Cat House is stylish living for your much loved moggies. With a large raised living area with room for beds, toys and litter trays, the apartment is accessed through a lockable cat flap. Access to the raised living area is gained though a regal staircase or ramps and corner shelf landings, with the addition of a third shelf for snoozing in the sun. Made with the same pressure treated timbers as our hen houses, access for the two legged is as just as easy, with a large access door on the front, smaller access door on the back and entry into the living area through a large hinged back panel, the Cottage Outdoor Cat House is luxury living for your feline friends. If you are looking for somewhere where your cat can stretch its paws whilst remaining safe and sound, an outdoor cat play pen is an ideal safe haven. Completely enclosed, constructed from strong pressure treated timber framing and galvanised weldmesh, it provides a secure playpen for your garden while still being able to survey his or her domain. . With the option of adding corner shelves and ramps for your cat to climb and with plenty of room inside for a cat house, it will keep your cat completely safe and sound and utterly stress free. The cat play pens come in various sizes to match all and any gardens (the junior range for smaller gardens) and is the best of both worlds (in letting your cat roam free of molestation while keeping them safe). Cats make wonderful pets and if I could ever get Blackie, the office cat, to wake up long enough to go outside into one of our pens to stretch his legs he would love it. Keeping your cats safe and secure can greatly increase their happiness, and a happy cat usually means a happy home. If you have questions about our cat houses or play pens why not leave us a comment or give us a call on 01300 345229. We have a pecking order here in the office. Anne gets cross that someone hasn't replaced the paper in the printer and moans at me, I moan at everyone else, everyone else moans at Sprocket the office dog and Sprocket goes away and sulks at not getting a biscuit from the office biscuit barrel. While this system is somewhat unfair to the loyal (if not loud and yappy) Flyte so Fancy pooch, it is however how pecking order's work. The numerous hen houses, poultry pens and even in the FSF chicken field all have their own pecking orders too. There is a chief hen at the top of the order and one hen on the bottom rung. Part of establishing this pecking order, is the actual pecking. Feather pecking is something that hens do, the occasional nip here and there in passing is part of being a hen, however when this moves over into full blown aggressive feather pecking then this is a problem that should be dealt with immediately. Here are a few top tips on how to help prevent feather pecking among your birds. It sounds like a simple point, but are your girls getting enough sunlight. Whilst chickens do like a dim relaxed nest box for laying an egg, living in permanent gloom will slowly just get them down, leading to vitamin deficiencies and possible feather pecking. They don't need twenty-four constant daylight beaming down on them, but to feel the sun on their feathers improves their mood no end. While the life of a chicken might seem all sunny days and endless grubbing about for worms, it doesn't take much for a hen to get bored. Bored hens can quite easily turn to feather pecking and the quickest and easiest way to cure the issue is to hang some boredom busting treats around the coop to distract them. A busy hen is a happy hen. Making sure your chickens diet is healthy and balanced besides helping with the more obvious aspects of your hens well-being can also aid with feather pecking issues. One of the causes of feather pecking is a protein deficiency. Feathers are essentially made of protein and so pulling them out and eating them is a last ditch source of this necessary supplement. Making sure that you have given your girls a good quality feed with a decent percentage of protein in it (16% in the Smallholder Layers Pellets range) will help with the growth of new feathers and hopefully avoid the issue entirely. Always make sure that your hens aren't overcrowded. If you have more hens then can realistically fit in your coop then they will very quickly become stressed. They will become stressed and begin to peck at each other as they attempt to secure themselves a spot. 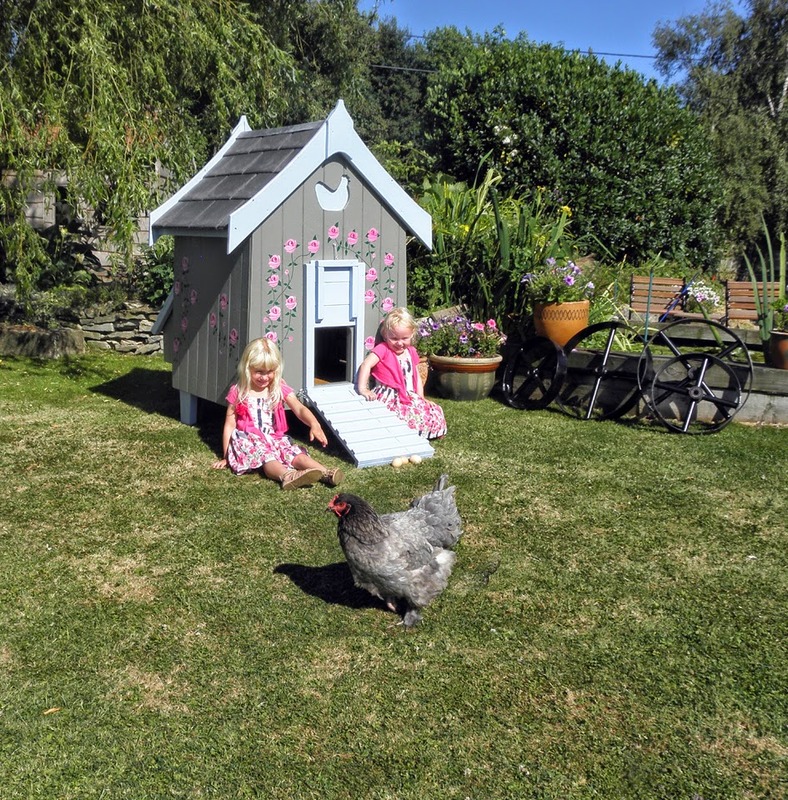 Give your hens the appropriate amount of space that they need. Introducing a new hen into an established flock can often lead to the bullying of the new hen, feather pecking included. Before introducing new hens, put them in either a separate run or boxed off in an area of the existing run where they will be safe. The important part is that the hens can see each other! After a few days they quickly become acclimatised to each other and you can then introduce the new birds into the flock properly. There are some great products on the market to help your hen who is being bullied, from anti-pecking sprays to gentian violet antiseptic spray to help relieve the pain, although these are not always the answer to the problem. For a more in-depth look at feather pecking take a look at our new information page on the website and if you have any questions or tips why not leave a comment below. Flyte so Fancy's location, tucked away in the corner of the Blackmore Vale in Dorset, is one of the prettier places I have lived in. In fact all year round, the surrounding countryside is a rustic idyll worthy of a picture postcard. This charming backdrop doesn't come without a few extra problems though, rats and mice in particular, are something that we keep an extra sharp eye out for in our poultry paddock. When you think of poultry predators, the first thought to come into peoples heads is the cunning and resourceful Mr Fox. 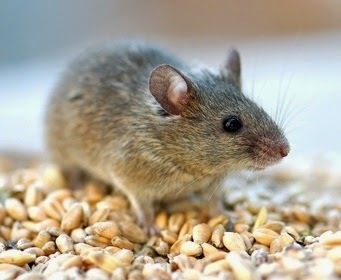 However, poultry keepers agree that Rats and Mice are a persistent and particular nuisance when keeping chickens. It isn't however the chickens themselves that attract the rats and mice, but rather their feed. If you have your feed badly stored, or your hens are prone to making a mess while feeding then chances are sooner or later you will attract rats and mice to your chicken coop. There are some brilliant feeders available that are designed to stop your chickens from throwing their feed around and making a mess. The Wise Feeder is a mountable feeder that immediately lifts the feed up out of the way of passing rodents. It then has various lips and dividers to prevent your hens from tossing the feed about, saving on feed and limiting the number of vermin attracted to the area. 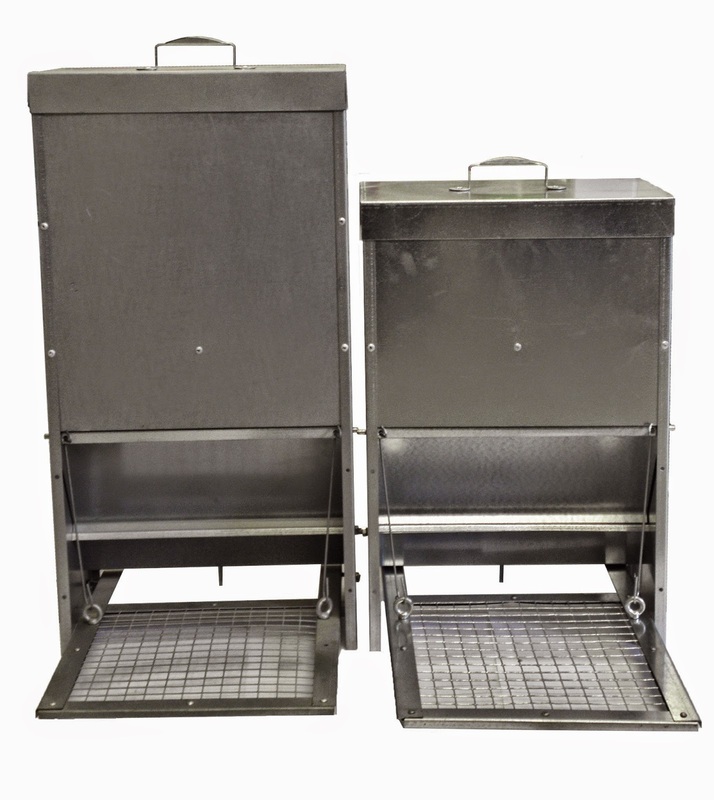 Galvanised vermin-proof treadle feeders also help to reduce the number of rats and mice. It works off the simple expedient that vermin do not weigh enough to open the flap covering the feed (equally smaller wild birds do not weigh enough either) meaning that only the chickens can access the feed, while at all other times it is securely stored away. A good option for keeping mice and rat out of the garden, perhaps the most traditional option, is a large and preferably hungry cat. Although a cat might not be everyone's idea of the best way to control vermin population, there are plenty of other ways to keep rats and mice populations low. Rat Bait Boxes, properly situated along hedgerows, by woodpiles and around the chicken coop (places where rats and mice tend to run and have nests) provide a place to put down rat poison in a locked container, where larger animals, birds or even children can not get at the poison. The Tunnel Rat Bait Boxes work particularly well, as they can be put along vermin's usual pathways for them to run right through. Another way to help deter mice from around your chicken coop is using an Ultrasonic Indoor Mouse Deterrent. A safe option, meaning other wildlife remains unaffected, these pest controllers are a great alternative to poisons or traps. They do however have a proviso. They can only be used indoors, i.e in your stable where you keep you hens or actually inside the house with your hens. Emitting a 40khz ultrasonic pulse every eight seconds, they can cover an area of 1000 square feet, keeping mice away from your birds. Securely storing feed in a strong feed bin. A good feeder that prevents spillage and waste. Meaning your hens can roam free and happy, while you don't have to worry about a plague of rats or mice descending upon your homestead. If have any of your own ideas for deterring vermin, or have a question why not leave a comment below. After a well earned holiday in the Cognac region, where I bored many members of my family by tediously pointing out the many different breeds of hens that the French keep in their gardens. "Le Poulet et Mille Fleur!" Somehow my pronunciation of chicken breeds in an awful french accent combined with linguistic skills to be found wanting, were not warmly received. I was certainly happy to return to Flyte so Fancy and commence talking about Gallic hens for as long as possible. In my absence from FSF HQ however, we had a rather unexpected arrival in the chicken field. Out of nowhere, Guinea Fowl chicks had hatched. Our flock of Guinea Fowl had originally come to live with us a few years ago, one because their gorgeous feathers are lovely to look at. But secondly, they make great fox alerts. Guinea Fowl form a tight watchful flock, making great guard birds, because as soon as they see a fox (or any other sort of danger) they make an awful lot of noise, often scaring the fox into thinking that it has been seen. Guinea Fowl are originally from West Africa and were introduced into Europe in the 16th Century as a game bird for the table. Guinea Fowl also come in a lovely range of colours, at Flyte so Fancy we have a flock of Pearl Grey and one lovely Pearl white bird. Guinea Fowl are very hardy birds and expert foragers, making them very easy to keep, but if you're considering keeping some Guinea Fowl here are some of the key points. As mentioned, Guinea Fowl are expert foragers and given a large enough area to range in, during Summer can find nearly everything they need themselves. That being said, many people feed Guinea Fowl on a standard chicken layers pellets, or at least provide additions for the Guinea Fowl to eat. Do Guinea Fowl need a House? Guinea Fowl housing does not have to be elaborate. They will often find the highest point to roost and can be found up in trees. They are of course safer if they are put into a house at night and it is fine for them to be put in with your hens. You might find that there is some hassling of hens by your Guinea Fowl, as they are mischievous, but usually they will co-habit peacefully. If left to free-range constantly however, Guinea Fowl can become harder to catch should you need to, as they are incredibly good fliers and can take to the wing quickly if spooked. Guinea Fowl can be trained to use a coop if done from a young enough age (to help bring them back to their coop, feed them by it each evening at dusk to help bring them back each to evening to their house). Can I Eat Guinea Fowl Eggs? Yes, you can eat Guinea Fowl eggs. On average a Guinea Fowl will lay around 50-60 eggs per year, although it can be as many as one hundred. They are not particularly fussy where they lay their eggs either and if they construct a nest, they tend to be very well hidden in tall grass or in a difficult to access place. They are light brown and usually roughly half the size of a larger hens egg. They are usually a little more rounded on the top. Guinea Fowl will sit on and incubate their own eggs, as we discovered last weekend here at FSF HQ. Whilst the Guinea Fowl at Flyte so Fancy live to be a roving team of sentries, many people also keep them as meat birds. The Guinea Fowl at Flyte so Fancy have been part of our flock for a few years now and it's not uncommon, when they are in good voice, to hear them chattering away in the field from my office chair. We will be keeping a steady eye on our Guinea Fowl chicks, although their excellent camouflage makes them hard to see, as they grow up to join our larger flock of chickens, ducks and geese. It has been hot here at Flyte so Fancy HQ for roughly a fortnight now. Now, don't think I am complaining for one second. Summer in Dorset is a wonderful thing, but whilst I am able to placate the staff rumblings and mumblings with ice lollies and ice creams each afternoon, keeping the feathered flock at FSF cool and calm during this heat is a lot harder. Their are two ways to keep a hen cool. Firstly shade and secondly plenty of fresh water. As I'm sure many of you know, chickens do not have sweat glands so when it comes to keeping cool for a hen, the task is a bit more difficult. When the weather is hot, you will see your flock being more active in the mornings and evenings and retreating out of the sun during the rest of the day. You might see your hen basking in the sunshine, laying in a sunny spot with a wing splayed and soaking up some rays, they're just enjoying the weather, but it is vital to make sure that you have somewhere for them to stay out of the heat, for a siesta. 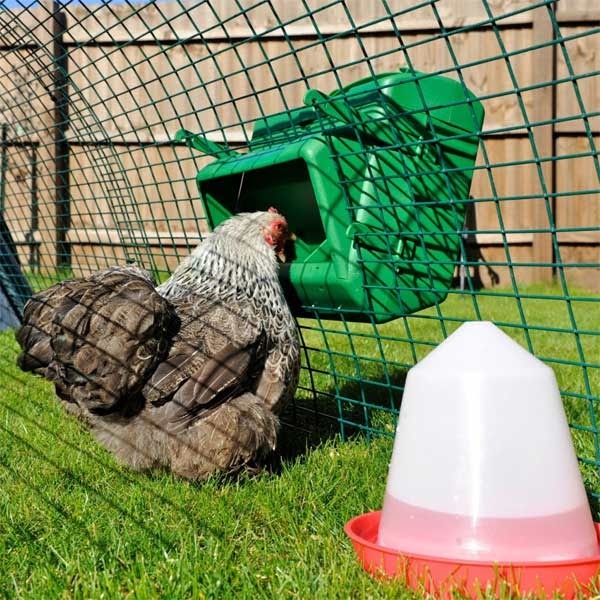 Chicken Shelters have many functions and are often thought of as primarily keeping the rain off your girls during the long cold British winters. They do however equally serve the dual purpose of providing a cool shady spot for your hens to get out of the harsh summer sun. The inability to sweat means that one of the best ways for a hen to stay cool is to retreat into a cool dark spot. If you don't have room for a separate chicken shelter in your poultry pen or run, having a long legged hen house provides a place, in a similar manner, for chickens to retreat to during the midday hour. Having a good supply of water for your hens is important too. While the FSF ducks and geese are happy to continually launch themselves into the pond for a cooling off, with the exception of our swimming chicken, the chickens and guinea fowl need plenty of water throughout the hot weather. We have a variety of poultry drinkers in the field, from lying bucket drinkers and honeypot drinkers whose contained drums help keep water fresh, through to troughs and some of the smaller Combo drinkers for our growing chicks. We have also made sure that their are enough poultry drinkers, with plenty of capacity to ensure that all of our flock can get a drink and that they don't run out mid way through the day. If you're wondering which drinker might be best suited for you, have a look at OUR VIDEO, as Boss Phill talks through some of the selection available and highlights some of the best bits of each. Short of following your chickens around with a fan and a nice mixed corn ice lolly, providing plenty of shelter and water for them is the best way to see them through this hot summer were having. If you have any questions, or even your own suggestion on keeping hens cool, why not leave a comment below. In the last week we had a phone call from a lady who had gone to pick up her hen only to discover she was carrying a disgusting handful of maggots. Obviously horrified she quickly gave us a call to find out what had befouled her prize hen. 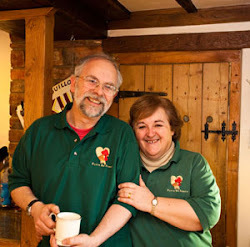 Over the last year and a bit the Flyte so Fancy Blog has tried to cover all aspects, joys and tribulations of keeping chickens. From the hatching of new team members in the poultry paddock through to dealing with issues like red mite and poultry worms. However, I must admit when it comes to our Blog topic this week I find myself feeling somewhat squeamish. Flystrike is a particularly nasty, however I will stress fairly rare, affliction that sees a fly laying it's eggs within a hen, with the result that the hen is eaten by maggots from the inside out. Yuck! It's scientific name is Myiasis, however flystrike or flyblown is how it is more commonly known. Flies are attracted to exposed tissue, but it can also be through strong odours like a messy chicken coop that reeks of droppings, open wounds or sores and even cuts and scrapes. One of the problems of flystrike is that it can happen very quickly. Within twelve hours of a fly laying its eggs, maggots can emerge and start eating your bird. 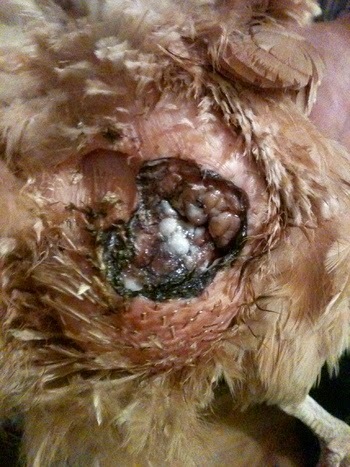 This is obviously not a nice experience for your hens and can be fatal if not dealt with. Keep your hens bottoms clean. If they are messy give them a bath. Pasty vent in particular can be a great attraction to flies. Keep your coop clean. Poultry disinfectants and Diatomaceous Earth liberally used will keep the hen house fresh. While Flyte Coop and Run Sanitiser or Stalosan will soak up any moisture within your coop. Hang Red Top Fly Traps around your chicken coop. The Red Top Fly Trap effectively catch and contains flies using a non-chemical lure. Lasting up to twelve weeks it drastically reduces the problems caused by flies. They should ideally be placed roughly 15m from your hen house to keep flies well away from the vicinity and you will also wish to place it away from your home as it really does smell quite horrid when it begins to fill with flies. Some fresh herbs, like lavender and basil can help deter hens. Remove all of the maggots as quickly as possible. Clean the wound using Iodine from the chemist and if the attack is particularly bad a trip to the vets might be necessary. Equally for cleaning the wound an antibacterial spray or wound powder will help and always something handy to have on the shelf. A nasty affliction to befall any chicken, whilst rare, it is equally easy to avoid by keeping your hen house in a clean and sanitary condition. As with most chicken related infliction's prevention is better than cure. If you have any questions why not leave a comment below or give us a ring on 01300 345229. While the sun shines continues to shine down on our corner of Dorset Elysium, Flyte so Fancy is a buzz with the workshop creating great clouds of saw dust at record speed, the despatch team zipping back and forth with parcels a-plenty and the office team answering all manner of poultry posers. Down in the chicken field the ducklings have taken to the pond, like a duck to water, the new arrival of some Gold Laced Hamburg chicks from the incubator have added to all the usual feathery fun on the poultry paddock. However, this week I had a rather long conversation with a lady who had just lost one of her much treasured birds to a poultry predator. She was however unsure as to which miscreant had done the deed in broad daylight. After talking through the options and suggesting some ways to help reduce the chances of it happening again, the FSF Blog turned its attention to a quick run down of poultry predators. HUNTING: Day or night really, although it tends to veer towards day time. SIGNS: Dogs tend to kill as part of playing. A bird which has been killed with little eaten and with bedraggled feathers has probably been subject to a dog attack. DEFENCES: The best way to stop dogs is to have a strong secure fence or back garden. If you have both chickens and a dog as pets it is unlikely that your own dog will attack your birds, it will most likely just ignore them. Other people are responsible for their own dogs and cannot allow them to just wander into your garden, the law is on your side in this case. SIGNS: These birds are omnivores and will eat anything. Many people have the problem of them stealing their feed from chicken feeders already. They are known to enter chicken coops and steal eggs right out of nestboxes or to steal chicks. DEFENCES: An enclosed run is the best option. However the legal Larson trap exploits their territorial instincts to make them stay away. A treadle feeder will seal away your feed from the birds making it less likely to draw them to your garden in the first place, as they are not heavy enough to work the treadle system. EATS: Adults, Chicks and Eggs. SIGNS: These animals kill their prey by biting the neck, so if they have visited your coop the signs of attack will be to the head of your bird. Usually they will kill several birds at once. If they are eating your eggs often small teeth marks can be seen remaining in the shell. DEFENCES: These creatures are able to slip through incredibly small gaps, so make sure your girls run is secure and that it uses a small strong weldmesh, preferably inch by half inch. Equally be sure to cover any ventilation gaps with mesh also. HUNTING: Night, worse in winter as they look for somewhere warm like a chicken coop to seek shelter and food. SIGNS: More likely to go after your chicken feed than your actual chickens, rats are opportunistic predators and steal eggs and chicks, if not small birds. They tend to take anything back to their nests but tell tale signs are raided feed, rat droppings near the feed, signs of gnawing and lots of holes and burrows near your hen house. DEFENCES: Make sure your coop isn't located right next to somewhere rats would ideally live i.e woodpiles and compost heaps. Keep feed secure and stored in a strong feed bin. A long legged hen house can dissuade them. Finally either get a cat or baited boxes. By law, poisons needs to be in sealed locked containers to avoid other animals getting into them. Also make sure that your bait boxes are located in sensible places, their is no point leaving it in the middle of the lawn, rather position them along rat runs like hedgerows or around areas that they like to nest. SIGNS: Badgers are omnivores and will eat small birds. They don't tend to take the bird away, so often birds are found dead in the morning half eaten. DEFENCES: Badgers are strong so make sure your chicken coop is sturdy and well constructed. Good diggers, so either electric fencing or no dig skirts for your chicken run can be utilised for keeping these pests out. SIGNS: They are often seen hovering overhead before swooping in. A bird of Prey's sharp beak and talons leaves distinct deep, stabbing cuts on a birds body. DEFENCE: An enclosed chicken run is the best defence. Equally the hanging of shiny things, like CD's or plastic bottles can help deter them. HUNTING: Active twenty four hours a day, more likely to be at night. SIGNS: A cat will eat a whole chick, but often leaves the feathers of larger birds. DEFENCE: Similar to dogs, birds are rarely attacked by your own cat. It is other people's cats coming into your garden which is the issue. Unlike dogs, cats have the right to roam where they like and so it is upto you to keep your birds safe, enclosed in a run or within the limits of your garden. HUNTING: Usually at either dusk or very early in the morning, however they are becoming a more common sight during the day, especially during cubbing season and in towns. SIGNS: Foxes will often kill several birds at once and then carry them away just one or two away with him. Just because you've scared a fox away doesn't mean he wont already have devastated your flock. DEFENCES: Foxes are adept at digging and climbing. They can scramble over fences or walls up to 6ft high. Equally they are very good at climbing onto a ledge of some sort (bins, a low branch etc) and then leaping over a wall. A good sturdy poultry pen, with strong weldmesh and roofed in is the best defence. Foxes are also exceptional diggers, so a no dig skirt or an anti-fox electric fencing kit, which will stop them tunneling in is a must. Unfortunately for our lovely girls their delicious eggs, and themselves, are just as sought after in the animal kingdom. However, with a little planning and a good sturdy coop and chicken run there is no reason why poultry predators should ever be a cause for continued sleep interrupting worry. For more information on poultry predators have a look at our information page on the website HERE, leave a comment or give us a ring on 01300 345229. We had a customer recently bring a small jar into the Flyte so Fancy shop with a question as to what the small brown crawly insects were that they had found in their chicken coop during their weekly clean. The small brown crawly thing was quickly and efficiently identified as the pestilential poultry predator, the Red Mite. It was not red as it had not had a chance to feed, the blood drawn giving it it's distinctive red colour. Sensing a rare opportunity, I quickly grabbed my Dictaphone, set up two chairs and the obligatory pitcher of water, tested the sound levels for my interview, and settled in to ask the hard questions, a la Jeremy Paxman guest hosting Countryfile. Good Day, thank you for joining us. You are of course a red mite. Getting straight to it, perhaps you could start by telling us a little about your upbringing. Did your descent into crime start at an early age or was it a conscious decision? Well can I just clear something up that has been bugging me (pardon the pun) for quite some time now, Red Mite and Red Spider Mite are completely different things. Those harmless garden bugs have nothing on us parasites. Well to begin with I was an egg for around three days, which was certainly pleasant enough. When nesting conditions are just right we Red Mite can go from being laid as an egg to hatching in around three days. Interestingly we can go from egg to chicken biting adults in just seven days, meaning we can fill a hen house nice and quickly when we want too. Pretty impressive I think you'll agree. Indeed, and I heard an interesting fact the other day that you can survive without eating for a considerable time. 100% true. it's 8 months. Incredible, a red mite can survive eight whole months without feeding and I cant make it past breakfast. So, your eggs are laid and you live in the cracks and crevices of hen houses. It is of course common knowledge that you Red Mite enjoy the warmer weather but how can I tell if you're staying the night in my coop? Well we're not particularly morning people, I'm murder before I've had a coffee and we're usually pretty easy to see first thing, especially when we're filled to the brim with blood. Also if you see a build up of grey dust in your coop, that's probably us. We love a party but we're not usually one for cleaning up our detritus after ourselves. Of course if your hen is looking lethargic, its probably because I've been enjoying a gourmet dinner. After awhile anemia can set in for some birds. And is there anywhere where I should look for you specifically? Oh, well we like to be cosy, so under perches and in perch sockets. Some of us prefer to hide in the dust of the floor of the coop and in the joints, but we're never far away. Never have been one for a long commute. Interesting, you clearly take a great deal of pride in your work. But I wonder, if I may, to enquire about fame? How has it changed you? You are not of course the most popular of insects? Well its hard to compete with ladybirds that's for sure. Understandably, they are adorable. Maybe you could tell us a little more about any abuse, verbal or physical, that you might have suffered? Well first of all, are the Red Mite Liquids. Your Poultry Shields and your Total Mite Kills. Tsunami waves that not only destroy the organic matter we live in but when it comes into contact with our hard outer shells causes dehydration and death. So you think this is unfair treatment? Well its no where near as bad as what follows. Diatomaceous Earth. After our homes have been washed away, this terrible powder is sprinkled all over the coop. It might just look like powder to you but to us it is giant crystalline structures that scratch and scrape away our protective shells. I have recently heard of successful tests and uses of hen house fumers recently. Those are completely against Red Mite Rights and I have heard of populations up and down the country decimated by these effective red mite killers. Just a few final questions to wrap things up. Do Red Mite live on humans? No, but I might have a bite if you're passing. I've heard plastic hen houses prevent red mite. Your thoughts? Oh I'm happy to hang my hat anywhere, if there is somewhere to hide. Plastic hen houses can get quite hot and humid which we all love for living in. Well a fascinating guest, thank you for your time. Perhaps you can just give us a hint at your next big project? I'm sorry no. Sworn to secrecy. Ask me back next year. 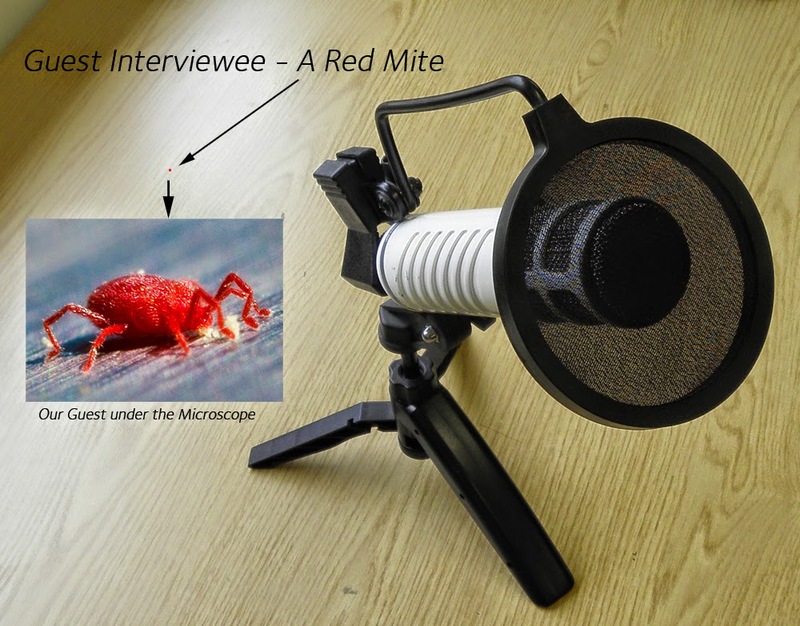 A fascinating interview with a Red Mite. We're currently trying to book a parasitic worm for next week. His agent is holding us up on price though. Typical.